BodyFit brings to you this Home Gym Set which has got an array of workout equipment to suit your workout and fitness regime. The gym set comes with different variants of weights, skipping rope, gym gloves, wristbands, bars etc. for a complete workout. You can try the different set of exercises and incorporate them in your fitness schedule with this Gym Set. With the Bodyfit Home Gym Set, you can try out many levels of workouts and fitness training. From hand exercises to dumbbell exercise to lifting, choose the appropriate workout item and you are good to go. Workout with style, with this pair of gloves which is a part of the Home Gym Set. Gym gloves are an essential part of any workout or weight training since they help you to grasp the weights with much more hold and also provide resistance to any form of slips or jerks. 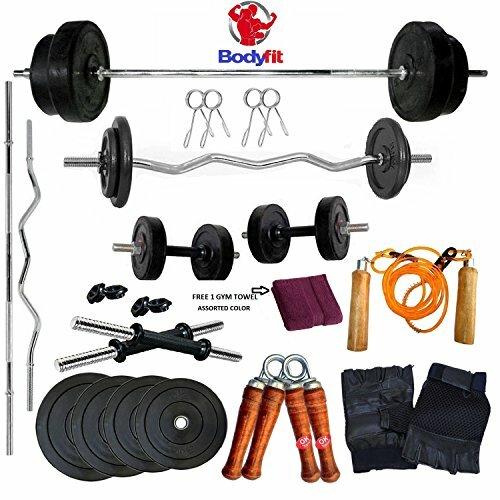 Bodyfit Total Gym Kit Combo 20Kg Home Gym,Set is the best product available online at the lowest price for a workout at home.